You may be relieved to know that I’m in much better spirits today. And that is because Charlie has had no more incidents. I’m giving him the medication and he seems fine. I’d say he might be urinating a bit more, but that’s to be expected. I called the vet’s office yesterday, and the tech told me to just watch him and if this clears it up he doesn’t need another ultrasound right now. I thank you all for managing to calm me when I start veering off the cliff with worry! 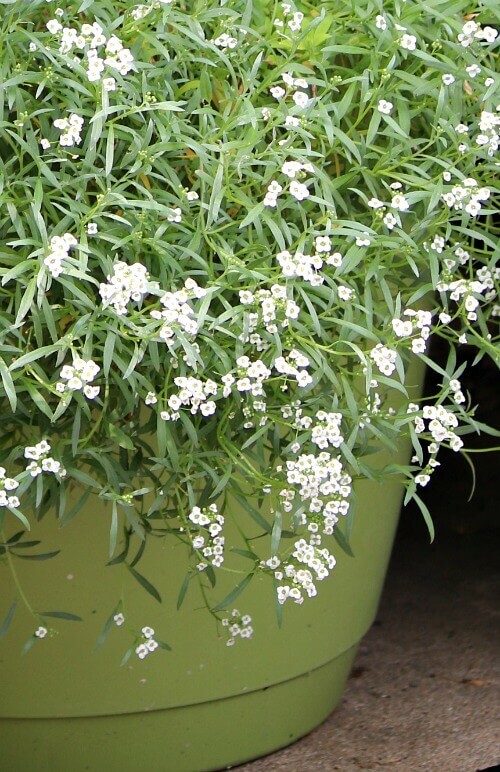 When it gets a bit cooler out, as it has been the past week, the white alyssum blooms again. I love it. It smells like perfume. I learned yesterday that my right eye has 20/20 vision. I could read everything on the bottom chart yesterday. Whereas in previous days I could see 3 out of 5 letters on the bottom line. I also learned that I now have to go back to Triad to have hours of testing on my left eye before I can get the left eye surgery. They are going to do the testing on the 30th. What is really aggravating is that I feel like I’m seeing double. Blurry, not quite focused. I put the palm of my hand over my left eye and I see clearer, but diminished a bit. I suppose because I have been accustomed to seeing out of both eyes. But I can make it through till September. I don’t exactly have any choice in the matter. And Charlie is happiest when I’m home with him. I’m trying not to be gone very long because he gets stressed. I saw my neighbor outside earlier when I was bringing some groceries in. They are moving Saturday. I wonder who I will get for a neighbor next? The manager said she’d try to get someone quiet in there. This four-plex is prime property because we have our own parking lot and no neighbors across from us. Just behind. The other two in this four-plex are single women. They’ve lived here longer than I have. And I’ve lived here over four years now. 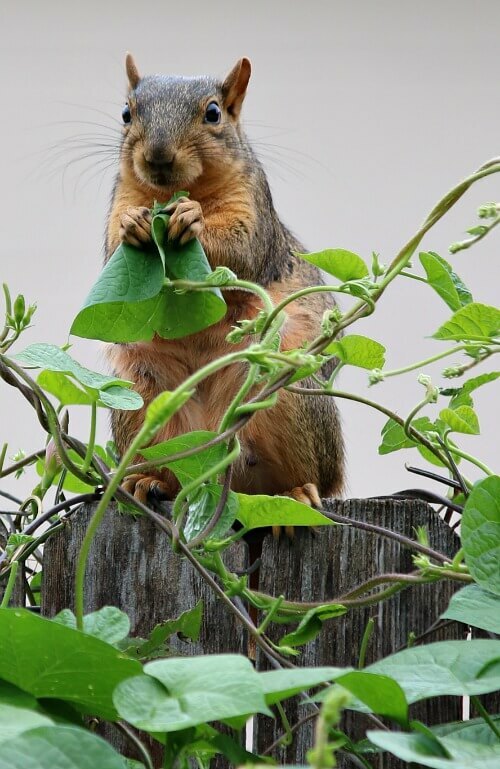 I caught a squirrel eating my morning glory leaves on the fence yesterday afternoon. Nearly drove Charlie nuts. But the squirrel was unperturbed. They really seem to love those morning glory leaves. I felt better yesterday after I was able to get outside on the patio and do a little maintenance on the plants. I needed that. Dr. Vincent told me to still take it easy. I love working on my patio. I avoided doing that the week after surgery because they told me to stay away from dirt completely, lest it blow in my eye I suppose. And when I work out there my eyes tend to get itchy. It isn’t always that way, but has been in recent months. I feel such calm when I can dead head my petunias and snip back plant growth that is getting out of control. Peace just descends upon me when I’m doing these simple tasks. Above is a photo of Charlie late yesterday afternoon. He does love his bed, as long as I’m sitting on the other end of the couch with him. Oh I’m so glad Charlie is doing better today, and you as well, Brenda!!! We worry so much about our sweet babies, don’t we? We sure do. That’s what mamas do. Glad to hear Charlie is better! It’s a zen time for me. Thankfully Charlie is doing better! It is a time of extreme stress when you start to fear the worse for them Brenda and there’s just no way around it. I use to try and limit my time away too as my boxer would just howl to the moon whenever I left. Thankfully I could take him most places with me and usually did. He was never destructive but he would just cry his heart out whenever I left. When we lost his little brother it made it all the worse. Then he went deaf making it even harder because no company anymore, no hearing anymore, man, his whole universe was ma and nothing in the world could comfort him except me. Use to cry my heart out over him even back then. Some of them are like this and feel great sadness when their owner leaves. It sounds like Charlie does too. You have to work with it the best you can. I don’t think I’ve ever heard Charlie howl. But my Boston terriers used to howl. Thank goodness the squirrels are easy to take photos of when they’re busy munching leaves. Happy to hear you are feeling calmer today and that Charlie is doing better. 20/20 vision in your repaired eye is excellent as well – things are going well. First time I’ve ever driven a car without glasses. oh dearest bean! when I see the notice of your post in my inbox I just hold my breath lately. I’ll be so glad too when your next eye surgery is over and done with. it would drive me crazy. I knew a lady who had them purposely do one eye for distance and the other for up close! I don’t see how she stood it. I don’t think I could. she claimed it didn’t bother her. good grief. the pictures on this post are amazing! that little squirrel and his morning glory leaf! OH MY! I bet you could be on National Geographic’s freelance payroll! I don’t know how she stands it. It’s blurry and confusing with my eyes like this. What a relief to hear that Charlie is feeling better. It is so hard when our babies are sick. It’s good to hear you in a better mood. Worry and stress do awful things to us. Being in your garden is calming to you so I’m glad you were able to do that. Hugs! What would I do without my patio garden? Yay Brenda! I’m so glad that everything is ok with Charlie and you! Have a great weekend! I plan to. It’s been a wonderful few days with rain on and off. Cooler weather has helped my mood. That is an adorable picture of Charlie! You could just eat him up! That also was a very fat squirrel dining on your garden. Wow, 20/20 vision, must be awesome. You can endure a little longer to get the other eye taken care of, just be careful to not do to much out on the patio and spend quality with Charlie boy. My fingers are crossed that you will get another nice neighbor as they do make it nicer. 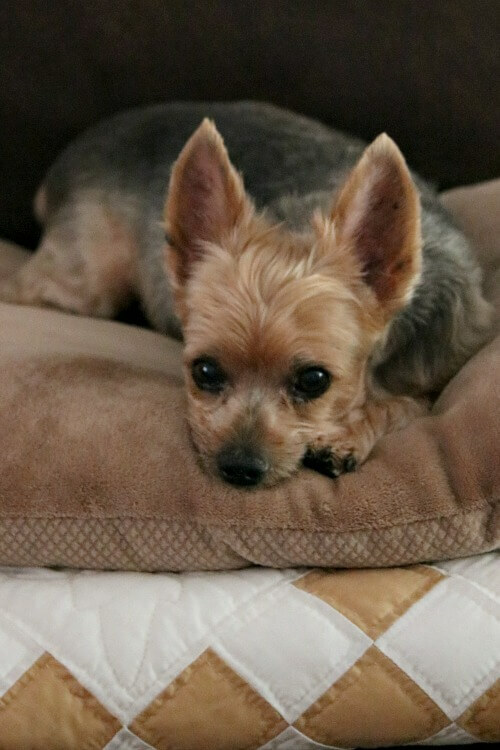 I too think Charlie looks mighty cute on his bed, Carol and Molly! Oh that is such great news about Charlie feeling better. Sometimes they are just such tender little things we don’t know what sets them off. And I’m so happy to hear your eye is 20-20. I’m impressed. Right now maybe it’s just the eyes adjusting to the new correction. Sounds like bright days ahead for you though. Pardon my pun. No, it’s going to be weird until the other eye is done I think. I know you are going to miss your neighbors. Sounds like they have been good neighbors to you. When I had my cataract surgery around 10 years ago I had the corrected lenses inserted. The Doctor did surgery on one eye. And two weeks later surgery on the other eye. So I had 20 20 vision in one eye and the other eye my poor vision of 20 300 . Doctor told me to take the lens out of my glasses for my good eye and leave the lens in for my bad eye. Of course when I took my glasses off I had one I could see out of and not the other. I can’t do that because my glasses don’t have frames. The lens is built into the glasses. Great news today. Glad Charlie is feeling better and that your vision is improved. Have a wonderful afternoon! You too! Cooler and rainy here. So happy to hear about Charlie and your good eyesight, so far in the one eye. When I had lasix surgery, I had one eye long distance and one eye reading. The brain adjusts for this and I’ve never had a problem. The human body and its ability to adjust and heal is truly amazing. My brain is not adjusting. Of course one eye is fixed and the other isn’t. Charlie is precious and he looks very content in that picture. That boy loves his bed. Abi never cared for it. He’s my baby. Even though he’s nearly 12. So glad Charlie is better! He is taking the same medicine as my cocker who is doing very well also. It makes us mamas feel so much better! Glad to hear things are going better for you and Charlie. When my sister was young and was being treated for “lazy eye,” she wore a patch over her good eye in order to try to strengthen the eye she wasn’t using. I thought about her eye patch when I read about your problem with the two different eye strengths right now. Perhaps you could consider getting an eye patch to wear over the eye that hasn’t had the surgery yet, so that you aren’t experiencing the confusing vision. A quick look online shows several brands of eye patches that can be found at drug stores. There are some that can attach to eyeglasses and some that have the strap around the head and look like what pirates wear. And some use adhesive to stick to the skin, which is what my sister wore. They don’t seem too expensive, looks like you can get a pirate patch for around $4. I will check into this. Because it’s driving me nuts. So glad that Charlie is doing better. That is good news. Happy Thursday and have a good rest of the week. You too, Kris! Love what you’ve done with your small space home! Wonderful news today in your post. Charlie is better, eyesight 20/20 in the one eye (and anticipating great eyesight in the other eye once surgery is completed), beautiful photos (especially of Charlie and the squirrel), you are back in the garden, and a little relief with a bit of cooler weather. I know that you will miss your wonderful neighbors but hopefully the new neighbor(s) will be wonderful too. Yes, they’re moving tomorrow in fact. Yes, it’s been a pretty good week. After the Charlie episode that scared me. Glad Charlies is feeling better and that the right eye has such good vision! The time will fly by and the other one will be done before you know it. Me too. A nice QUIET neighbor. The squirrel is BEAUTIFUL ! They are cute little critters. I love that squirrel picture! The way she? holds that leaf and the expression on her face is comical and almost begs for a caption. And that sweet Charlie boy. If that ain’t the cutest pic ever. So glad you two are doing better. I love to capture photos of the squirrels holding the leaves. Good for you and Charlie!! That new photo of Charlie is just adorable! He is such a cutie pie and he loves his mommy. My squirrels, at least the younger ones, will often eat some of my flowers. They seem to like the white daisies the most. They will jump up and “tackle” the stem and bend it over and play with it for awhile, and then munch away on the flower part. I suppose it’s their way of getting certain vitamins and minerals they can’t get any other way (?) While I was reading your latest post today I remembered suddenly how my doggies were always able to instantly pick up on my stress, or when I was sick, or when I was in a happy mood. They are very good at reading our expressions and our body language, and I think that we also may send off different kinds of smells that we are not aware of on OUR level but with their keener sense of smell, they are – and that also tips them off to our emotional state. If we are stressed, they know it. That makes them anxious. When our fur babies are sick, we have to try and stay calm so they don’t get “infected” with our transmitted stress. Like that’s easy to do, right? Practice over time helps, that’s all I can say. One other thing, I know Charlie is on a special diet and in any event, we’re not supposed to give our dogs “people food.” But when it comes to giving pills to a reluctant dog, the old bury the pill in a bit of liver sausage trick helps. It never failed me or my family if we had to give our pups pills. I’ve been burying his pills inside his treats he’s allowed to have from the vet’s office. So glad to hear Charlie is doing better! I can imagine how batty that would drive one to see perfectly fine out of one eye but not the other. I would probably end up with horrible headaches. Hope you can hang in there until the other eye is done. It IS giving me headaches. And eye strain. Brenda, that is such a sweet, sweet photo of Charlie. I’m so glad and relieved for you that he’s doing better. I was wondering if there was anyone who could come and stay with Charlie while you are gone to have your other eye measured. How is he with other people? I tho’t maybe just having another person with him would make him feel a bit calmer. Wow, 20-20 vision! That’s great. 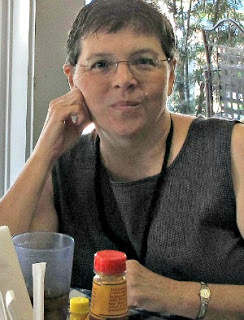 Does it mean you can see clearly in the distance and up-close for reading? Maybe you won’t know ’til you have the other eye done. Sorry you have to go through all that tedious testing again. I can’t remember doing that twice. I wonder if they did both my eyes at once. Hardly seems like it because each eye takes so long. Hope Charlie continues to be okay and glad that you are feeling calmer. Take care. No, now my vision is just reversed. I can’t see up close like I could before, but can see into the distance. Now I have to wear readers to read. I don’t know who could stay with Charlie. And I really think that would stress him more. That’s how my vision changed. Except there is that middle distance that isn’t clear with or without the reading glasses. It frustrates me no end! Regarding Charlie’s not dealing well with being left I just had a vision of you carrying a very large purse with Charlie in it everywhere you went! How would he go for that? Maybe wouldn’t like being so confined. What can you do? Maybe make a recording of your voice to play for him while you’re gone! I know, kind of crazy, but I just want him to not be so distressed when you have to be gone. Poor little guy.